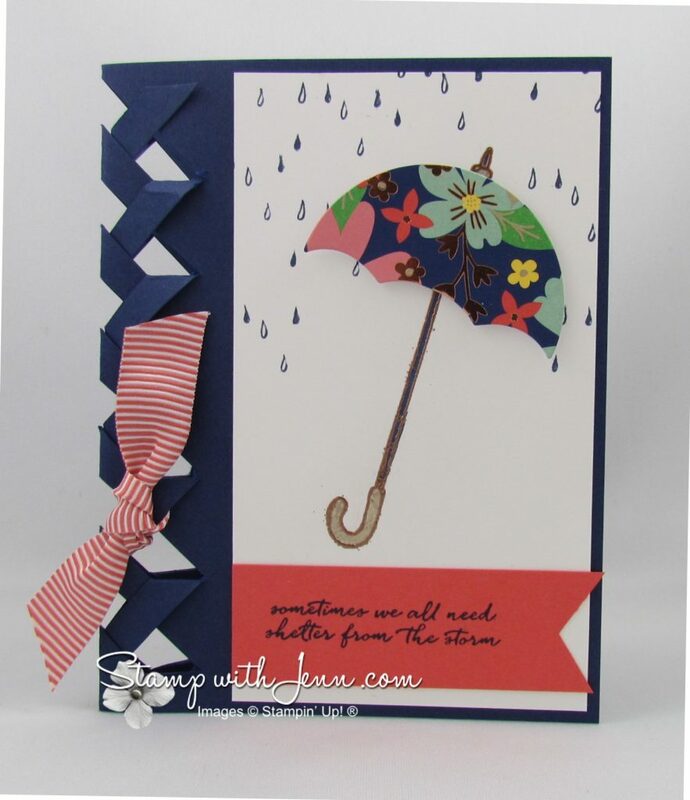 I used the Braided Card Technique (free template below for you) on this sweet umbrella card. We made a variation on this card at my last Stamp-A-Rama event. I used the amazing Weather Together Bundle (see my post here on another card using this stamp set) and the gorgeous Affectionately Yours Specialty Designer Series Paper. What is gorgeous about the Designer Paper is that several of the sheets in the package have a copper colour inlaid into them. I used a piece of this paper for the umbrella top and the copper just shines on the paper, especially when combined with the copper embossing I used on handle of the umbrella and paired with the Night of Navy colour. To see how I did the Braided Technique on this card, grab your free Tutorial HERE (it includes a template you can use too on your braided cards).